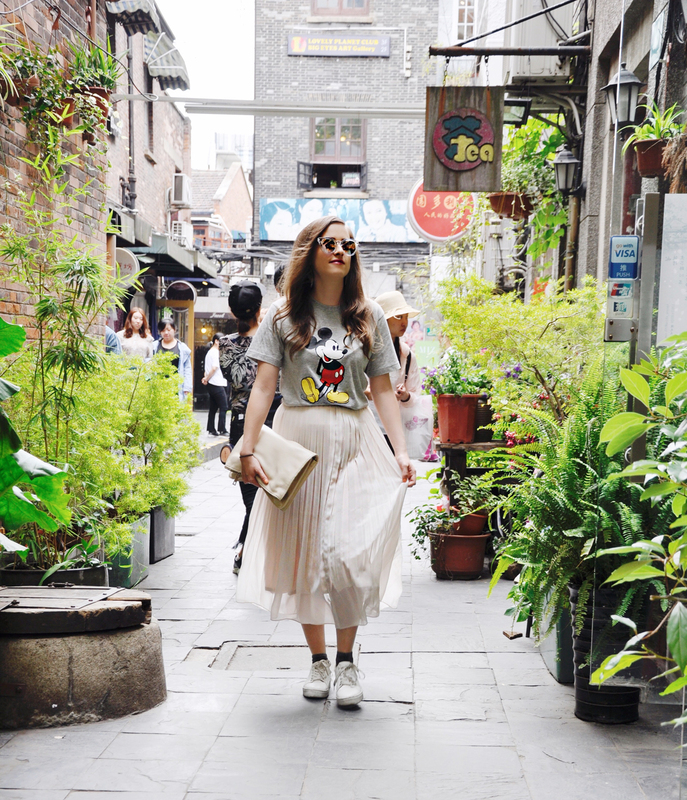 After my first part in Hong Kong, I want to show you my second part from my China trip, this time Shanghai. 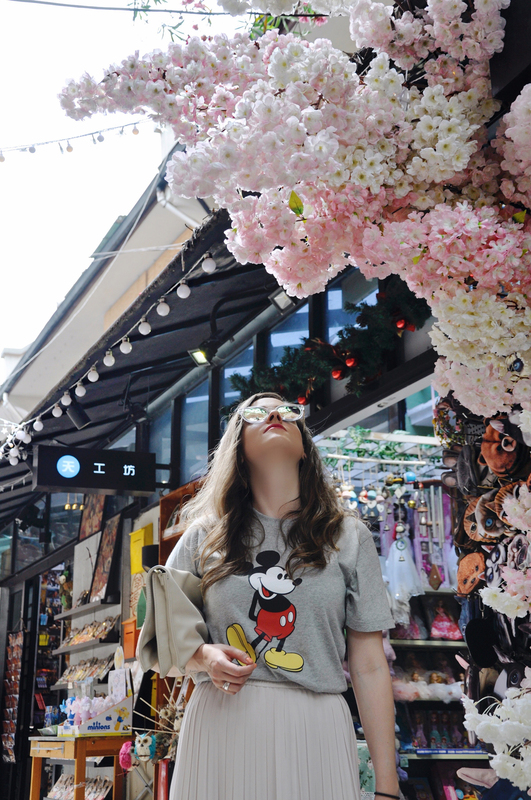 Shanghai also had some adventures for us. The city center has 15 million inhabitants and is one of the largest cities in the world. And she was really. One of the best thing, o get an overview of the city is a visit of one of the tallest buildings in the world, the Shanghai Tower. In the night it glows and glitters everywhere and you can hardly get out of astonishment. During the day we were traveling in different areas like the “Bund”, the “French Consession”, “Pudong” or in my favorite district “Tianzifang”. We also made these great photos in this district. Various artists have settled in this area with their studios. Also many cool coffees, restaurants, bars and various smaller shops are represented. 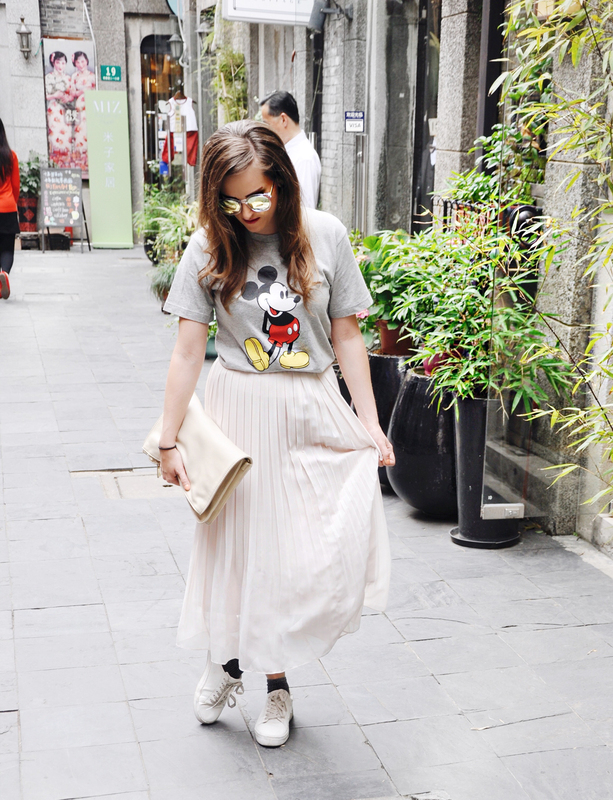 On the road I wear comfortable sneakers, a light skirt and to get a little color, a Mickey Mouse shirt. 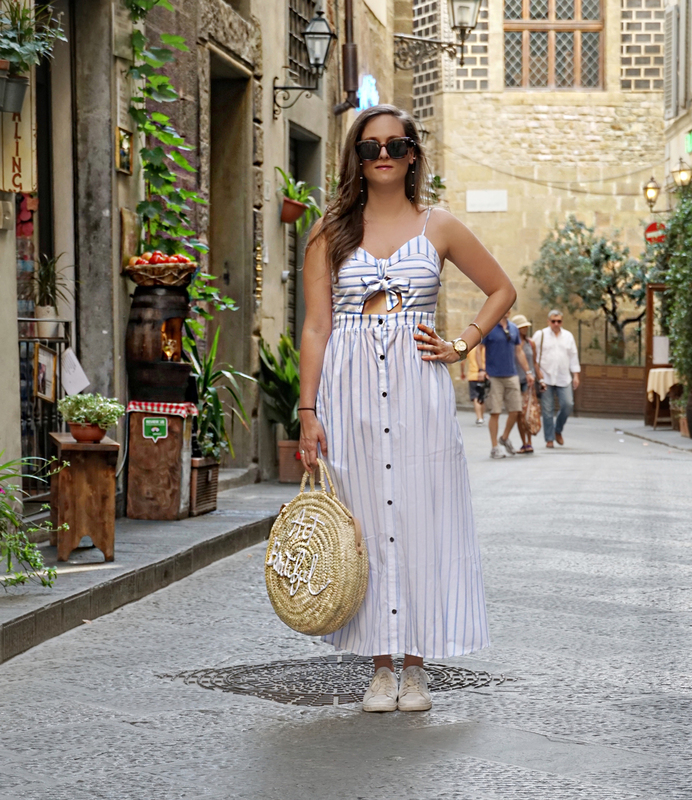 Such a great look my dear Andrea!!! 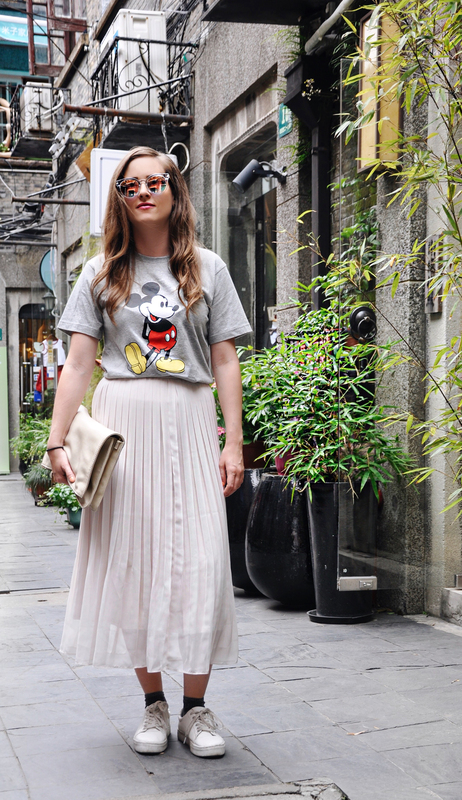 Love how you paired cool sunnies, funny t-shirt and midi skirt – exactly asian style! 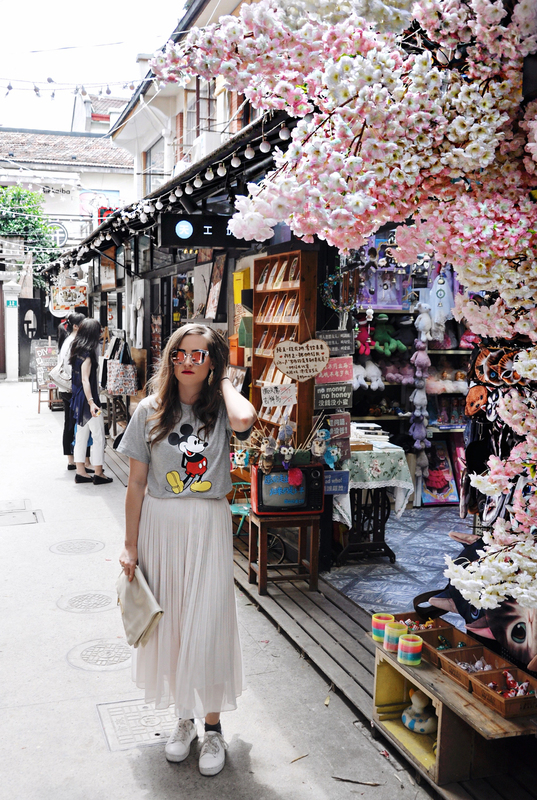 And cant get enough of that cute streets of Shanghai!!! Ein wirklich lässiges Outfit, perfekt zum sightseeing geeignet. Shanghai wow, was für ein tolles Reiseziel. I love pleated skirts so much!! I have to resist buying too many. These blossom photos are gorgeous! Wow! This look gives me such good vibes!!! Thank you so much for your kind words on my previous post. It means a lot when I write something that can relate to those reading it and I think it’s awesome that you’re in a field of work that you’re loving! 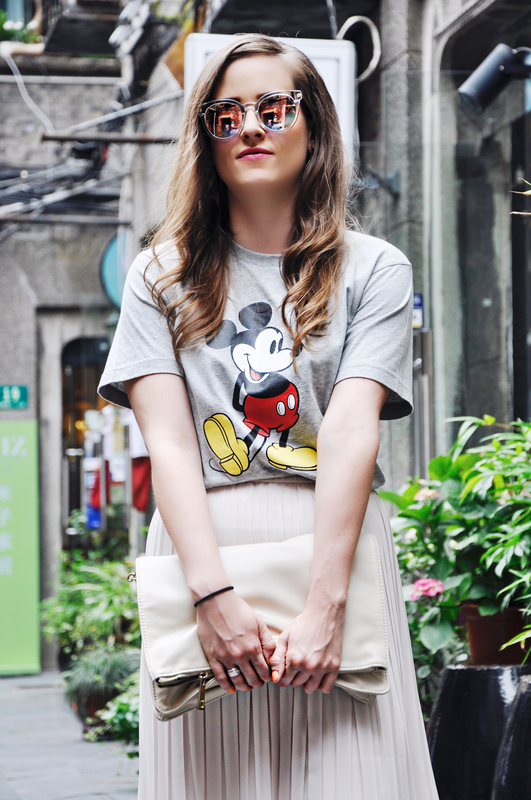 Such a fun outfit for exploring Shanghai! 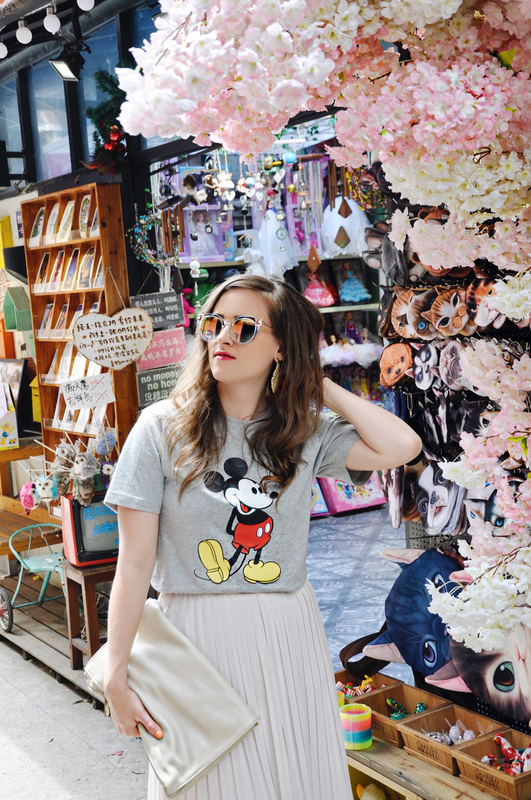 I love the Micky-tee and maxi skirt combo and those mirrored sunnies add such a perfect touch to the outfit! wow amazing look and amazing place! I’m a Mickey’s fan so I LOVE your shirt. Wow this looks so fun! Great place a s well! Thats so nice. Thank you so much for your comment. I appreciate that. I’ll check it asap. Thank you so much dear. Have a wonderful day.